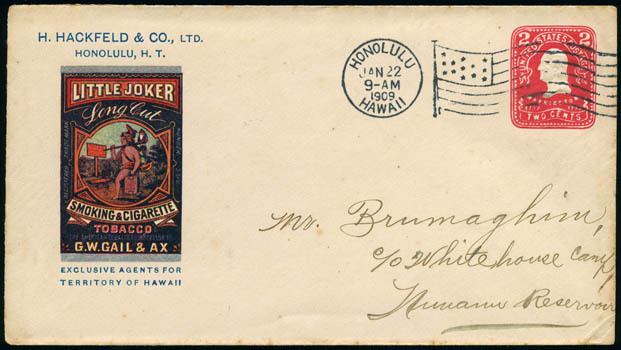 H. Hackfeld & Co., Ltd., Honolulu, H.T., multicolor illustrated advertising corner card showing Little Joker Smoking & Cigarette Tobacco design depicting an Indian, on United States 2¢ carmine entire cancelled by "Honolulu, Hawaii, Jan 22" wavy flag machine cancel, Very Fine. Peters-Uota No. HHC-IL-1 Estimate $400 - 600. ONE OF ONLY TWO RECORDED EXAMPLES OF THIS REMARKABLE TOBACCO ADVERTISING COVER DESIGN. 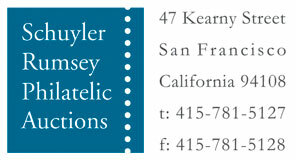 A link back to Sale 65 - Lot 330, along with its description, will be appended to your message.